At our place, we do church. No, we really. We do church. Especially this time of the year. Holy Week. It’s the annual rehearsal of the events that stand at the heart of the Christian Faith. It begins with Palm Sunday and culminates with Easter Sunday; and there’s a whole lot of really good stuff in between. It’s not uncommon in Roman Catholic and mainline churches to have a Maundy Thursday services and a Good Friday service. The Easter Vigil is not quite as common, but maybe it’s being done a little more often than it used to be. But what about Monday, Tuesday, and Wednesday in Holy Week? Really? You’re supposed to do that, too? A lot of folks are surprised that there are actually lessons appointed for those days, as if someone somewhere actually expected there to be worship on those nights. So, years and years ago, I decided that in the parishes I serve, we will worship every day during Holy Week. We will read those lessons. We will build those bridges between Jesus’ triumphant entry into Jerusalem and Golgotha and the Sunday morning garden. And am I ever glad we do. It seems that with each passing year, those Monday, Tuesday, and Wednesday services become more important to me. Each of those days bring us a lesson from John 12 and 13, the precursors to the more familiar lessons read later in the week. Each of them in their own way help set up what comes later. For instance, tonight we read the story of Mary anointing Jesus’ feet with expensive ointment and then wiping his feet with her hair. Of course, the burial ointment points to his death and ultimately, to his resurrection. But to have the chance to reflect on that right now, at this moment in time, to let that drama build to Friday and Saturday and Sunday, adds a depth to the entire arc of Holy Week experience. Tonight one of our staff members did a brilliant job of making those connections (You can read her sermon here: http://www.creativefamilyministry.com/1/post/2014/04/monday-of-holy-week-john-121-11.html.) Mary’s brother, Lazarus, had just been raised by Jesus. In fact, calling Lazarus out of the grave was one of the precipitating factors for the antipathy that Jesus would soon encounter from the religious leaders. So imagine that Mary was using some of the same ointment that she had used on her brother. And imagine her using that ointment knowing the connection she had already seen between death and life and Jesus. And imagine that Mary has somehow taken to heart Jesus’ own several predictions about his impending death. And imagine that Mary pours that fragrant ointment on Jesus’ feet with some foreboding that his own words are about to come true. There will be death. As there has been. As there always will be. But Jesus’ death will be something different. There will be resurrection. It’s only Monday. I don’t want to get there too soon. But there will be resurrection. And that’s good to know. Because in my own sin and failings; in my own disappointments and shattered dreams; in my own attempts to cross the boundaries of my creatureliness to be God; there must be death. It just has to be that way if there is any hope of life. And the burial spices that prefigure Jesus’ death also more powerful point to resurrection. Already. And it’s only Monday. This entry was posted in Uncategorized and tagged Jesus' death, Jesus' resurrection, Monday in Holy Week on April 14, 2014 by Jim Honig. Well done. Thank you. 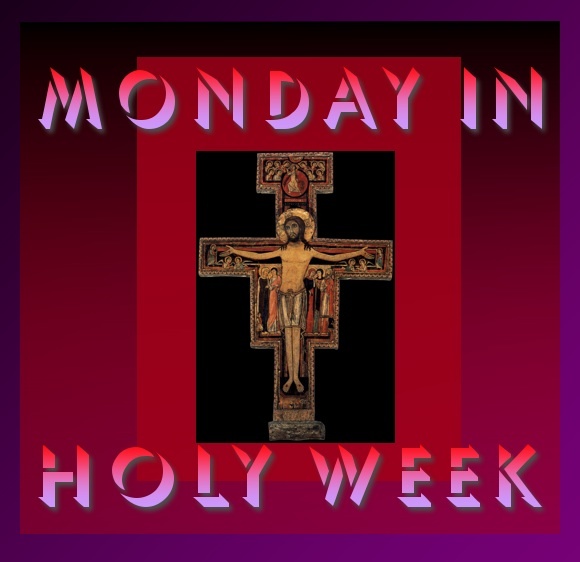 Was just wondering about Monday-Wednesday of Holy Week. Thanks, Marianne. As I mentioned, these services have become so meaningful to me. I don’t think, unfortunately, that they are very common.